Kerala’s most spectacular elephant and fireworks festival ‘Thrissur Pooram’ commonly called the pooram of all poorams.It is celebrated at Vadakkumnathan temple in Thrissur Thekkinkad maidan every year in the malayalam calendar month of Medam (April / May). Thrissur Vadakkumnathan temple is one of the most famous Lord Shiva temple in Kerala, situated in Thekkinkadu maidhanam, a center heart of the city, Thrissur. It is a 36 hours continuous event attracting thousands of pooram fans across the country, this festival is also the biggest attractive event for the international tourists. Thiruvampadi and Paramekkavu are the two major temples to make the festival a remarkable one. 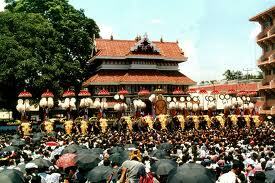 Thiruvampadi and Paramekkavu are the two major temples take part in the Thrissur Pooram Festival. The participant poorams are divided into two parts namely “Paramekkavu side” and “Thiruvambady side”. The Paramekkavu side consists of samll poorams from the four temples besides “Paramekkavu Bagavathy”. The constituent temple poorams are Pookattikkara-Karamukku Baghavathy, Choorakattukara Baghavathy, Chempukkavu Baghavathy, Panemukkumpilly Sastha. The Thiruvambady Baghavathy side consists of four small poorams besides Thiruvambady Baghavathy are Ayyanthole Baghavathy, Nethilakkavu Baghavathy, Laoor bagavathy and Kanimangalam Sastha. So Thrissur pooram is the poorams of pooram of these ten constituent poorams. The Thrissur Pooram starts at the time of Kanimangalam sasthavu ezhunnellippu and followed by the visit of the Devi from the Paramekkavu and Thiruvambadi temples to the Vadakkunnathan and other temples ezhunnellippu. A major event in pooram is Madathil varavu- is a panchavadhyam melam, participating more than 200 artists, consists of thimila, taddalam, trumpet, cymbal and edakka. At 2’O clock, the famous Ilanjithara melam starts, in which scores of artists playing drums, pipes and cymbals. After the Ilanjithara melam, both Paramekkavu and Thiruvambadi temples groups enter the Vadakkumnathan temple through the western gate and come out through the southern gate and laid in face to face in distant places. Two groups exchange colorful umbrellas competitively at the top of the elephants called Kudamattom. Next day early morning, at 3′ 0 Clock the night spectacular display of fireworks begins and it lasts till the morning. One of the Important attraction of the Thrissur Pooram is the display of fire works at mid night. The display of pooram fireworks will be on the seventh day after the flag hoisting.